Flair '16: Make America WOOO again! The Crockett Foundation has a brand new t-shirt in their online store. "Make America WOOOOO Again with this awesome 2016 Presidential Campaign T-shirt. 16 Time World Champ, 2016 Election Frontrunner…coincidence, we think NOT!" "With each sale that we make, we donate a portion of the proceeds to our a veteran or veteran service animal in need. Some of the things that we purchase for these wounded heroes are post-traumatic stress disorder trained service animals which help veterans cope with trauma. We also purchase music instruments for veterans which has been proven to help veterans with PTSD to rehabilitate with music therapy. Another way we help is to buy yoga equipment and train them in yoga therapy which will help them tremendously as well. "We set up our online shop and wrestling shirts store to also help wounded service animals by ways of paying for their veterinary care that is needed and also hope those canine hero’s find a loving home to be adopted into." 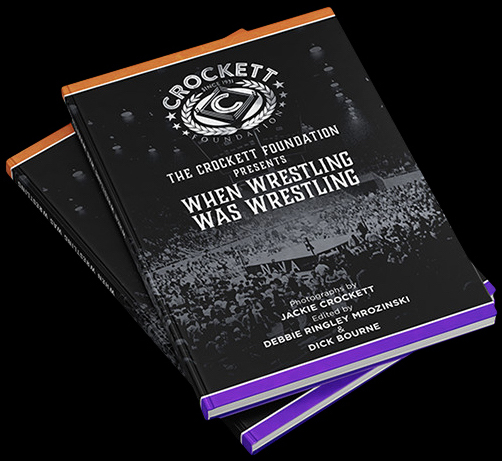 Check out all the cool items at the Crockett Foundation online store including their new book of wrestling photographs from the 1970s and 1980s "When Wrestling Was Wrestling", Four Horsemen shirts, Crockett Foundation logo gear and much more! Support the Crockett Foundation by visiting their online store today! As I've written about before here on the Mid-Atlantic Gateway, I always loved when wrestlers with Crockett-area titles defended those belts in other territories. 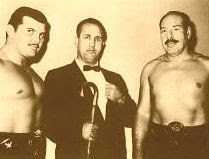 Specifically, the United States heavyweight championship and the NWA world tag team championships were occasionally defended outside the Mid-Atlantic territory in other areas such as Georgia, Florida, and Texas to name a few. 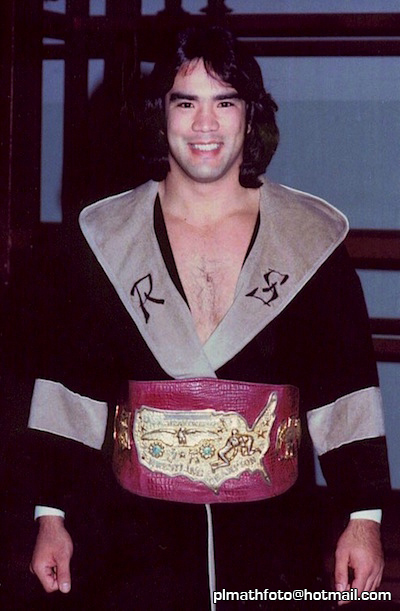 In December of 1977, just a few days before Christmas, Ricky Steamboat took the U.S. title to Championship Wrestling from Florida and successfully defended it in Miami Beach. He didn't go alone. His top rival for the championship, "Nature Boy" Ric Flair, was also booked for Eddie Graham's promotion the same night, but not as the challenger for Steamboat. 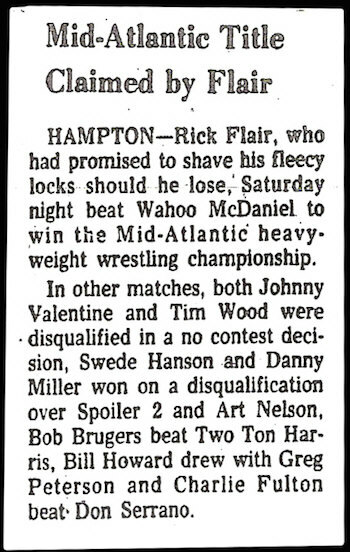 It was a bonus payday for both Flair and Steamboat, who were in the middle of what was Jim Crockett Promotions' annual Christmas break. Each year in those days, the Crockett promotion would shut down for two full weeks right before Christmas, returning to action for big shows on Christmas night. In 1977, the last Crockett shows before the Christmas break were on Tuesday, December 13 at their regular Tuesday stops in Columbia, SC and Raleigh, NC. 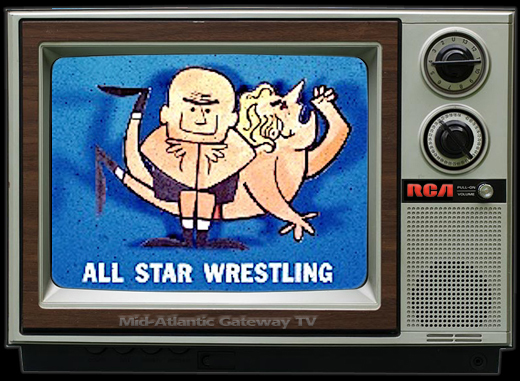 The next night, they taped multiple episodes of "Mid-Atlantic Championship Wrestling" and "Wide World Wrestling" at WRAL in Raleigh, including the annual year-end highlights shows, to get them through the next several weeks of TV while the company was down. 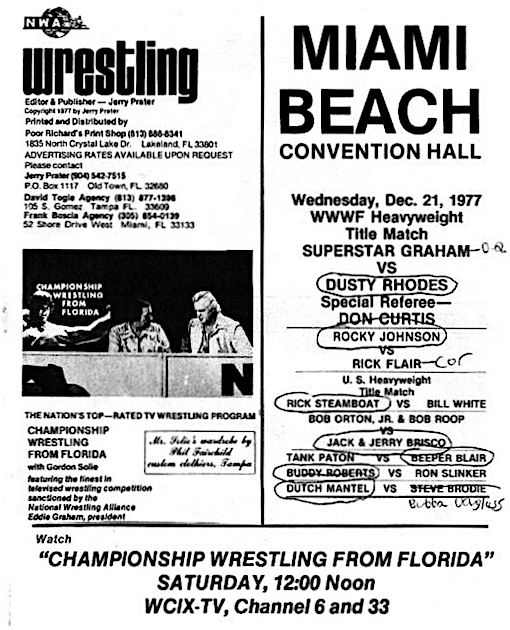 During the Crockett break, Steamboat and Flair took the opportunity to get themselves booked in Florida exactly one week later, on 12/21/77 at the Miami Beach Convention Hall. Steamboat was the reigning U.S. champion at this time, having defeated Flair for the prestigious belt in Greensboro, NC in October. He defended the title that night in Miami against another Mid-Atlantic regular Bill White. It was an interesting match-up and was likely White's only shot ever at the U.S. championship. Steamboat was successful in that title defense. 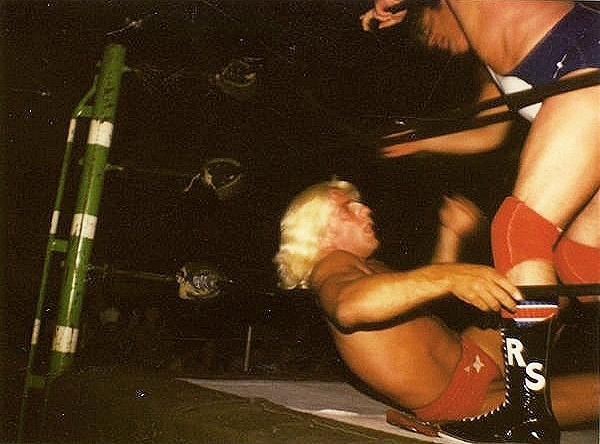 Flair wrestled Rocky Johnson in the semi-main event of this card, which was headlined by a WWWF title match between reigning champion "Superstar" Billy Graham and "The American Dream" Dusty Rhodes. Also on the big card were Jack and Jerry Brisco, Bob Roop, Bob Orton, Jr., Buddy Roberts, Dutch Mantell and many others. It was a homecoming of sorts for Steamboat. When he arrived in Florida in the spring of 1976 with only a few months experience under his belt, promoter Eddie Graham thought Richard Blood (his real name) looked so much like perennial Florida favorite Sam Steamboat, he gave him the name Ricky Steamboat. And the rest, as they say, is history. Before returning to Miami as United States Champion, Steamboat's last match there had been a win over Jim Lancaster in the preliminaries on a card in July of 1976. 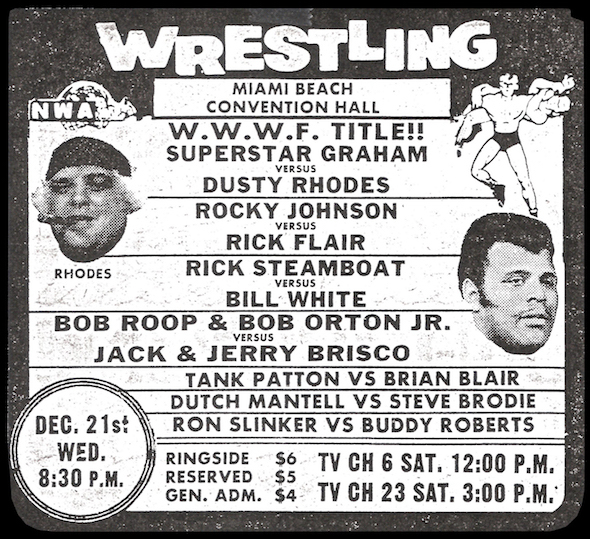 With Superstar Graham on the card in Miami to defend the WWWF title against Rhodes, and two of Mid-Atlantic Wrestling's top stars supporting that card, it was one of the more unique cards to take place in Florida in those years. Photographer and photo-collector Pete Lederberg owns the rights to photographs taken this very night in Miami Beach. The photos were originally shot by area photographer Brian Berkowitz. The title defense and those photographs are a cool little bit of history for Jim Crockett Promotions' U.S. championship. 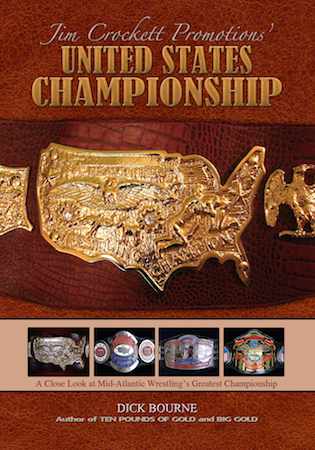 Berkowitz's photo above of Steamboat with the U.S. title belt was featured full page in color in the book "Jim Crockett Promotions' United States Championship", along with a few other photos licensed from Lederberg. See many other photos from this night (including match photos of Steamboat vs. White and Flair vs. Johnson) in Pete Lederberg's Facebook photo album: Miami 12/21/77. Thanks to Mark Eastridge, Pete Lederberg, Carroll Hall, and Barry Rose for their contributions to this article. Ric Flair and David Chappell in Raleigh, NC. The Ric Flair Show is part of the MLW Radio Network and presents a new show every Wednesday night. 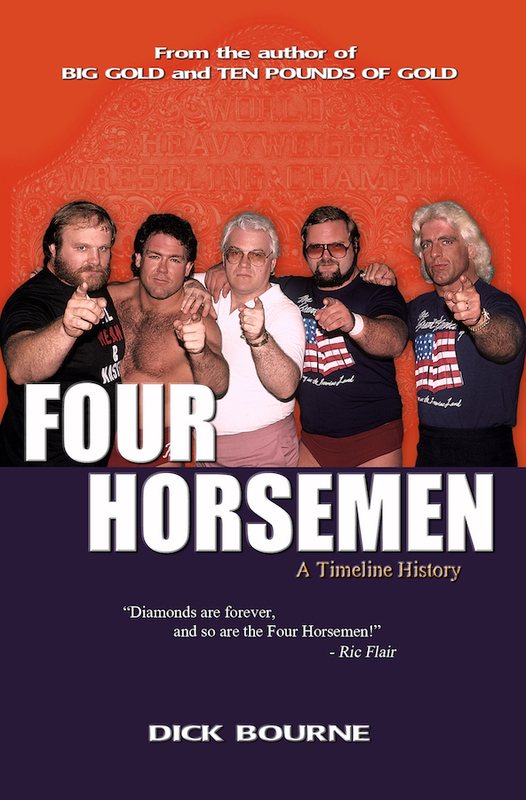 It's available on iTunes and all the other major podcast platforms, as well as at MLWRadio.com and RicFlairShow.com. 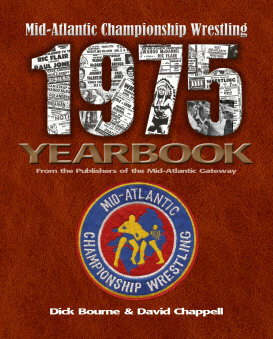 The Mid-Atlantic Gateway is proud to bring you "This Week in History" each week on The Ric Flair Show podcast. Co-host Conrad Thompson selects a terrific mix of great moments in Flair history as well as other memorable moments in which the Nature Boy was involved, including special audio clips and Ric's take on that point in time. It's one of our favorite parts of the Ric Flair Show! Download it every Wednesday night! Wooooooo! photos, programs, and so much more! Gene Anderson & Ole Anderson beat Paul Jones & Tiger Conway, Jr.
A mainstay in Mid-Atlantic Championship Wrestling for eight glorious years, Ricky Steamboat personified what it was to be the consummate “good guy” both inside and outside the ring. From early 1977 through early 1985, fans of Jim Crockett Promotions in the Carolinas and Virginia could always count on Ricky to valiantly battle, and usually slay, the wrestling giants that roamed the heel side of the talent rich Mid-Atlantic Wrestling roster. Steamboat’s most famous Mid-Atlantic rival, the boisterous “Nature Boy” Ric Flair was the perfect foil for Ricky’s unassuming and unpretentious character. But there were times when Flair aligned himself with the forces of good, and he and Steamboat became a formidable tag team combination to the fans’ delight. 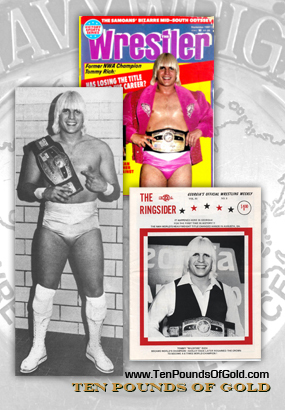 Later during the Mid-Atlantic era and beyond, Ric Flair ruled the roost as the NWA World’s Heavyweight Champion and he and Ricky had memorable bouts over wrestling’s most prestigious title. On February 20, 1989, “Steamer” realized his dream of becoming NWA World Champion by beating Flair, and the three match series between Steamboat and Flair at that time is widely viewed as the greatest championship trilogy in professional wrestling history. Exciting news came out recently that Ricky Steamboat and Ric Flair would be doing a Mid-Atlantic reunion tour of sorts in the fall of 2016, retracing their steps in the Carolinas in a rare series of joint appearances. 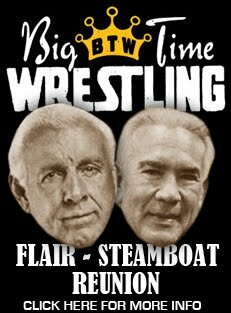 Big Time Wrestling sponsored mega events in Morganton, North Carolina on September 22nd, Raleigh, North Carolina on September 23rd and Spartanburg, South Carolina on September 24th will feature the homecoming of Steamboat and Flair, along with a cavalcade of other wrestling stars from today and yesteryear. 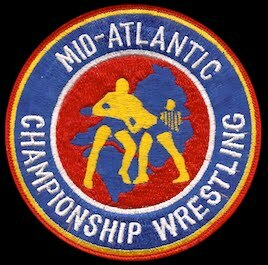 On the eve of Ricky Steamboat once again “teaming” with Ric Flair in the Carolinas, version 2016, the Mid-Atlantic Gateway had the privilege of chatting with Ricky about that upcoming reunion, the glory days of the Mid-Atlantic Championship Wrestling promotion and assorted other topics. 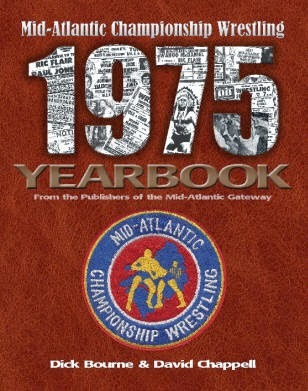 While Ricky Steamboat found success wherever he competed in professional wrestling, including being inducted into the WWE Hall of Fame in 2009, he will always be considered a “Mid-Atlantic guy” by those fans who cut their wrestling teeth with big bites of Ricky Steamboat versus Ric Flair in the Mid-Atlantic area, in some of the greatest matches ever! David Chappell: Hey Ricky, thanks so much for visiting the Mid-Atlantic Gateway today. Greetings from Richmond, Virginia! Ricky Steamboat: Thank you David. Richmond Coliseum, we would go there every other week on a Friday night. Chappell: Absolutely. Boy, I tell you what, those were just wonderful times. I don't think that magic has ever been recaptured. I saw one of your very first matches in the Mid-Atlantic territory. It was actually at a spot show just outside of Richmond on March 4, 1977 at the Colonial Heights High School gym, and this new guy named Ricky Steamboat was wrestling Jacques Goulet. Of course, we had never heard of you. But after a couple of minutes with Goulet, it was pretty obvious you were going to be a big deal! Steamboat: 1977 would be the year in which I did go to the Carolinas from Atlanta. In the early part of the year, I think it would be February or March of '77. I don't remember that match particularly, but I do remember Colonial Heights. I do remember Jacques Goulet. He was from Montreal, Canada. I think he was like a Sergeant. Chappell: Yes, Sergeant Jacques Goulet! I thought he was excellent in the ring. Speaking of being excellent in the ring, you actually wrestled excellently as recently as 2009 in the WWE and suffered a scary injury in that brief stint. Can you tell us a little about that, because I was never real clear what happened then. Steamboat: The incident happened on Monday Night Raw through Nexus. They brought me out because they were introducing my DVD about Ricky “The Dragon” Steamboat, and his career. We had these guys come out. They had just come up from the WWE school and they were trying to create some heat; four of these young guys. I had my hand in with all of them, and helped with training them down there at the school. During that live event on Monday Night Raw, I ended up with what they call a subarachnoid hemorrhage. In other words, I got thrown down real hard, and I ended up with a brain bleed. Chappell: Yeah, we were really worried about you. We'd hear stuff, obviously, well after you experienced it. It sounded really scary. Steamboat: It was a bad situation for me because the doctor said they could not do anything for it, it either had to stop on its own, or if it continued, the pressure would kill me. It was down inside my brain. They said unlike an aneurysm, which is mostly a surface bleed, to relieve the pressure they would drill a little hole in your skull and let it bleed out. The problem with mine was that they couldn't get to it. I was in intensive care for almost a month, which I didn't think anything about it at the time because I was so drugged up on the pain medicine because of the pressure in my head. Being in intensive care for almost a month, the doctors say was a very long time. Most people go to intensive care, they're there for three or four days and then after that, they get moved up to the next level. Steamboat: I was in there for almost a month. It was a bit hard for me. Chappell: I know it had to be, and everybody is just thankful that you were eventually okay. But on a happier note, how great is it that you and your top Mid-Atlantic rival Ric Flair are going to be making joint appearances in the Carolinas in just a few days? Wouldn’t you love to get in the ring and wrestle him just one more time?! Steamboat: I would really love to get in the ring with Flair, but the doctor told me my head's been traumatized too many times throughout my career, chairs and 2x4's, and DDT's on the cement floor from Jake Roberts! Chappell: (laughs) Okay, I guess it’s understandable why it’s not going to be a physical deal! But how do you feel about just getting together with Ric again and hitting these old Crockett towns together? Steamboat: This is such a great pleasure for me, and I also know it is for him. Even during our heyday, in the 70s and 80s when we campaigned through the Carolinas and Virginias, we had a lot of respect for each other when it comes to being a professional person in the ring. People ask about were you guys friends, and I would say yes, but we never hung out. Chappell: You really couldn't hang out in those days could you? Steamboat: Yeah, kayfabing was the number one deal. Even to invite one over to one's house to have dinner in a private way never took place. Our lifestyles were totally different. What you saw of me was the way I was. What you saw of him, the flamboyant guy was the way he was. To get together now is great; we have a show in Raleigh and we also have one in Spartanburg. To get together with Ric Flair, it is so rewarding for me on a personal basis. I also want to tell the fans this does not happen too often. Chappell: That's true, very true. I think that's the great part of these upcoming events, Ricky. I don't remember… I'm sure you probably made a joint appearance or two with Flair after your in-ring days, but it certainly is not commonplace. Steamboat: Let me say this. I actually retired in '94, so I've been out a little over 20 years. Both Flair and I have been doing these appearance gigs during this time. I'm going to be very honest with all my fans out there; we have been together on two other occasions for autograph signings in the past 20 years. Chappell: Wow, I didn't know it was that limited. Steamboat: Between the two of us, I know we have done hundreds and hundreds of appearances around the country. For us to get together on the same date in the same town, to sit side by side with each other is very, very rare. I'm pretty excited about it. 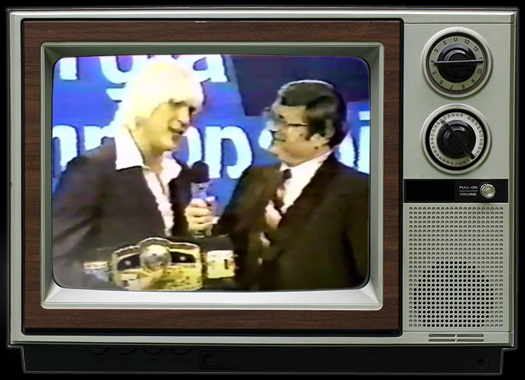 Chappell: And at the Raleigh and Spartanburg events, the fans will have the option to do a photo op with both of you together with the “big gold belt” as a prop! Steamboat: Yeah, that's very rare to get our autographs, but at the same time get a picture with us with the World Championship. It's a very rare moment. The fans coming away at the end of the day with that, being able to put it in a photo album or frame it and put it up on the wall is very, very rare. The fans that are going to be able to do that, I'm not going to say will be very lucky, but I think will be very fortunate. I couldn't tell you when the next time the two of us will be able to hook up and do this again. Chappell: I think that's well-said. You've already hit on a couple of things I wanted to touch on with you, kind of reading my mind on these. You talked about not really being able to hang out with Ric much during the Mid-Atlantic days. I sort of divide you two in the Mid-Atlantic era between the early days when you were the babyface, which of course you always were, and Ric was the heel. Later, and I remember this really well, because one of the first big matches when Ric turned babyface, you all teamed up in Richmond. I don't think there were ever more people trying to get into that building, the Coliseum, than when you all unexpectedly teamed up. Do you have any thoughts of when you two were feuding over the U.S. belt when he was the heel, and then later when Flair became a babyface as well, and that dynamic? Do you have any particular recollections of those two time frames? It's hard to get my arms around the fact that it has been 35 years since Ric Flair won his first NWA world championship. It was a Thursday night on the west side of the Missouri River in the venerable old Memorial Hall in Kansas City, KS. Many folks erroneously report the change as happening in Kansas City, MO, an easy mistake to make I guess. Promoter Bob Geigel's Heartland of America promotion based out of Kansas City played host to the title change. 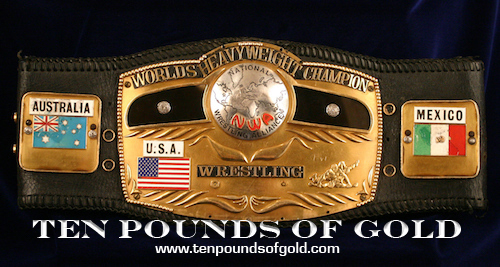 Legendary former 6-time NWA world champion Lou Thesz served as special referee in the title match that featured reigning 2-time champion "The American Dream" Dusty Rhodes defending the historic, majestic, almost mythical title belt known as the "ten pounds of gold." NWA President Jim Crockett, Jr. of Jim Crockett Promotions was on hand for the title change, too. 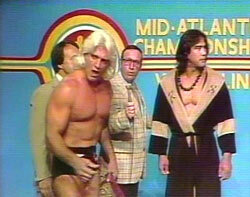 Crockett promoted Flair's home territory known as Mid-Atlantic Championship Wrestling out of Charlotte, NC, and was Flair's sponsor with the NWA board. 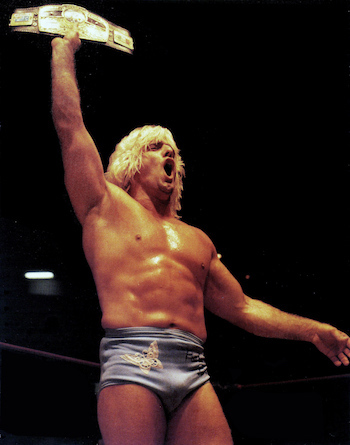 Flair has often lamented the fact that his first NWA title victory was not in his home territory, or in a neutral location more familiar with him such as Atlanta. Ric's parents were on hand to see him win the championship. It obviously meant a lot to him to have them there. If I'm not mistaken, I believe he has said it was the first time they ever saw him wrestle. The belt itself meant a great deal to Ric. He has spoken and written before about the first time he saw it, around the waist of Jack Brisco. All of the guys he thought so much of during that era that held that title all wore that belt, from Brisco to Harley Race, to Terry Funk, and now on that night in Kansas City he stood across the ring from Dusty Rhodes knowing he would soon wear the fabled title belt, too. 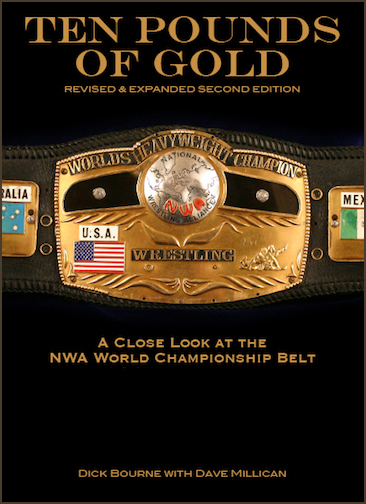 When working on my book "Big Gold", Conrad Thompson and I sat with Ric at a local bar in Duluth, GA. Conrad asked Ric straight up, of the two NWA world title belts that he held - - the domed-globe and the "big gold" - - which belt he liked better. 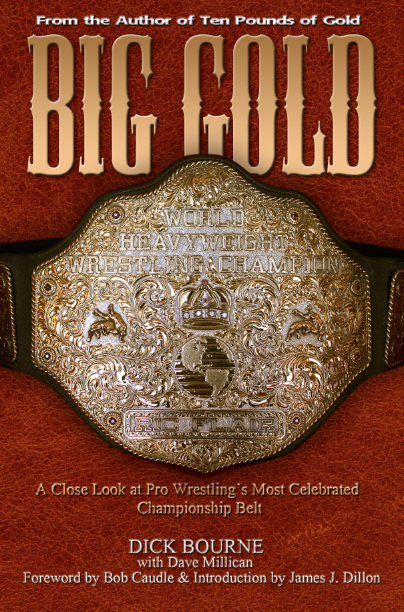 Ric admitted that the Big Gold belt was the fan's favorite and that it was no doubt the best looking belt ever made, but the belt that meant the most to him personally was the Ten Pounds of Gold. It was his first, and it had been held by the giants in the game at that time. Sentimentally, there was no choice. Ric Flair went on to hold 16 world titles (more, if you count some unofficial wins), including the NWA, WCW, and WWF world titles. He is pretty much universally recognized as the greatest world champion of all time. And it all began 35 years ago today, September 17, 1981. 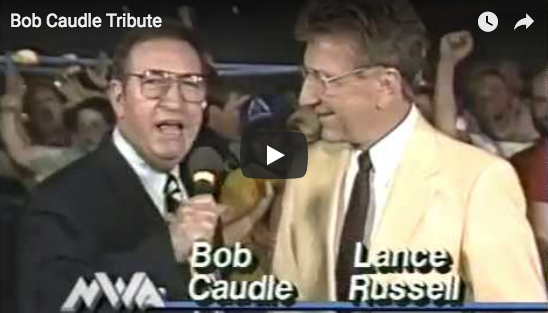 Mike Cline, longtime friend of the Gateway and publisher of the terrific Mid-Atlantic Grapplin' Greats website, forwarded to us a link to an article on the WBTV-3 TV website. The article is ostensibly about a current WBTV reporter, David Whisenant (author of the article) reconnecting with Charlotte area radio broadcasting legend Larry Bruton. After not having been in contact with each other for many years, David had received a letter and a package from Bruton. 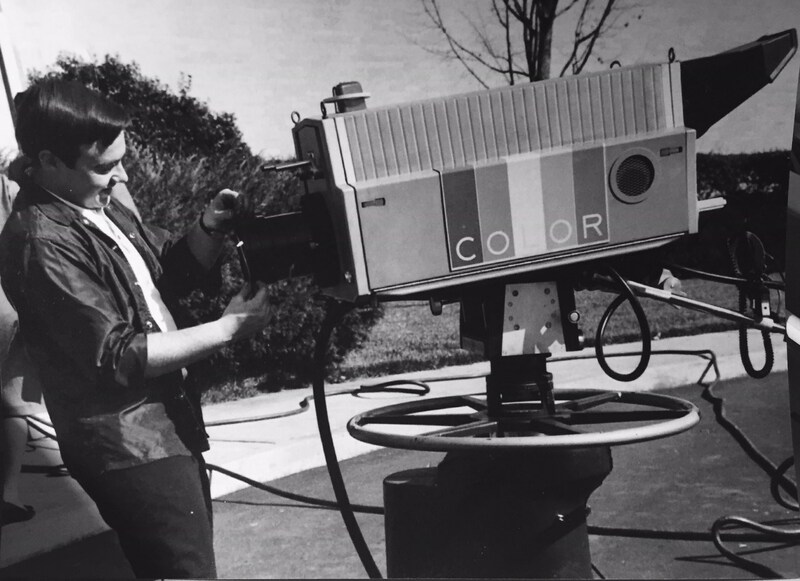 The package contained a gift for David, a 1960s 16mm Bell & Howell movie camera that was used to record silent film footage of local news events that would be used on the local WBTV TV newscasts. It was a memento from Bruton's career that he wanted David to have. The letter, however, also contained a nice little Charlotte-wrestling memory Bruton had from the 1960s that related directly to the 16mm silent film camera. Here is an excerpt (emphasis mine) from Whisenant's article that relates to Bruton's wrestling/auto racing story involving legendary pro wrestling manager Homer O'Dell. "I shot film with this camera from a race car at speed at the Charlotte Motor Speedway that was broadcast on WBTV in 1966," Bruton wrote. "We taped Bill Ward's Championship Wrestling show on Wednesday nights for rebroadcast on Saturdays, and one of the wrestling managers was named Homer O'Dell. I think Homer was one of the first "bad guy" wrestling managers who shouted and threw chairs and such. He was best known later for the tag teams of Brute Bernard and Scull Murphy, and Rip Hawk and Swede Hansen, but in 1966 he had two nasty wrestlers named Bronko Lubich and Aldo Bogni, a couple of real knuckledraggers." Bruton said that at the time, O'Dell realized the value of a cross promotion between wrestling and racing. "To promote his wrestlers, he had bought a patched up 1964 Ford race car, hired a driver, and officially entered the 600," Bruton recalled. "During race week Homer came into the studio to tape the wrestling matches and began showing around pictures of the car. I asked him if I could come to the speedway the next morning and try to shoot some film from inside the car while it was on the track for practice. Homer was all for it, and they said they would rig up some kind of seat for me on the passenger side. When I got to the track, the 'seat' was an upside-down wire milk crate sitting unattached to the floorboard...no shoulder harness or seatbelt. And nobody seemed to question any of this. These are the kinds of things you do when you are young and stupid. Anyway, I locked an arm around a roll bar support to steady the camera and off we go around the track at full speed. I held the camera braced against my chest pointing it out the windshield and the side windows, and we used the film on the 6pm newscast, so I'd say WBTV scooped the network in-car cameras by about 13 years." Bruton says the race cars actual performance on the track wasn't as exciting. "In the big race, the car blew up after only twenty laps or so, and the Homer O'Dell Wrestling #96 Ford finished dead last," Bruton added. "I think he gave up race car ownership shortly after that an d went back to fulltime chair throwing." It's nice to come across even the smallest recollection from an era in pro-wrestling that is now largely forgotten or ignored. It's part of what Mike Cline does on his Grapplin' Greats website and what we strive to do here on the Gateway. It's nice to know Larry Bruton has some of those wrestling memories tucked away, too, and was able to share them with David Whisenant in his letter. The Bell & Howell camera may have been the gift to Whisenant, but the wrestling memories are gifts to all of of us. This feature includes CLASSIC AUDIO from December 1979. In addition to a number of great matches, this card at the Richmond Coliseum had some unique features. This event was promoted for a good three weeks beforehand, as the holidays had caused the wrestlers to skip Richmond for several weeks. This event was a very rare Sunday card. Matches were almost always held in Richmond on Friday. Something else unusual was that this event was a 2:00 p.m. afternoon card. 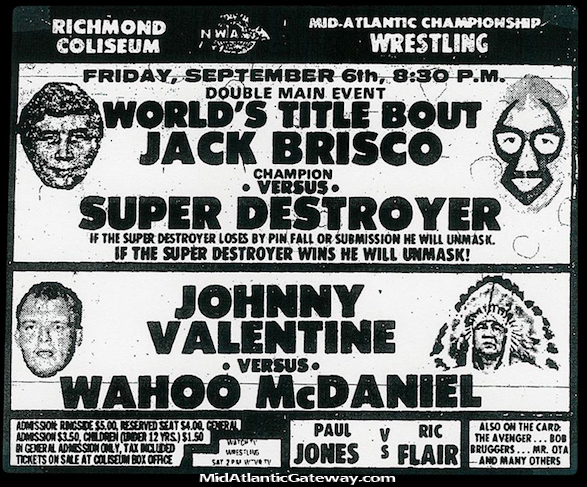 For whatever reason, Richmond was not a city that had its wrestling during the daylight hours. This spectacular afternoon event was also the last card held in Richmond during the decade of the 1970’s. What a fantastic decade the 1970’s were for Jim Crockett Promotions, particularly the mid and late 1970’s! The main event of this card saw United States Heavyweight Champion Jimmy Snuka successfully defend his crown against Tim Woods. Gene Anderson had just become the manager of Snuka a week or so before this bout. The feud between Snuka and Woods had been building throughout the Fall of 1979 when Snuka (managed by then manager Buddy Rogers) injured the neck of Woods in a television match that aired on World Wide Wrestling. Woods came back sporting a neck brace and carrying a baseball bat (he called it the "ding-bat") vowing revenge on Snuka. Woods went as far as to print up and distribute "Wanted Posters" for Rogers and Snuka in arenas during this time frame. (See the poster at right.) This match in Richmond represented the end of this feud , with Snuka coming out on top. 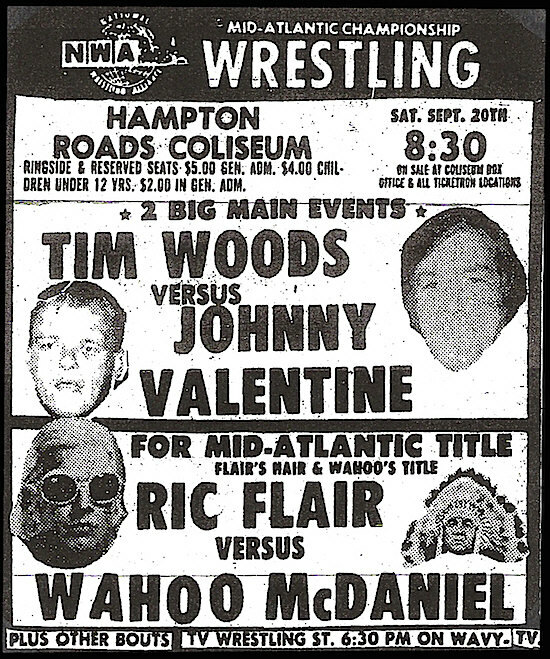 This would be Woods’ last Main Event ever in Richmond, and he would wrestle only one more time ever in Richmond-two weeks later in January in a mid-card match. A somewhat inglorious ending for one of Jim Crockett Promotions’ biggest stars in the 1970’s. The semi-final bout saw Mid-Atlantic Heavyweight Champion Jim Brunzell defeat newcomer Ray "The Crippler" Stevens. Brunzell was at the height of his Mid-Atlantic run with Jim Crockett Promotions. Stevens had just entered the area about a month previously with a tremendous national reputation. Stevens immediately singled out Brunzell and his title. 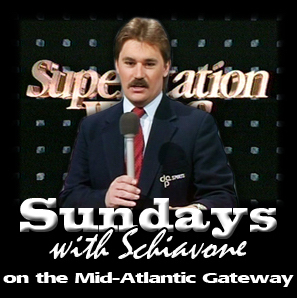 In interviews leading up to the match, both competitors brought up their previous feud in the AWA. The heat between these two seemed genuine, and their styles both in and out of the ring were completely different. With these contrasting styles, it all added up to a terrific match where Brunzell came out on top, but Stevens ultimately became a bigger and more long-lasting star in the Mid-Atlantic area. Ray Stevens: "I like to hurt people." Jim Brunzell: "That belt would make a nice Christmas Present." 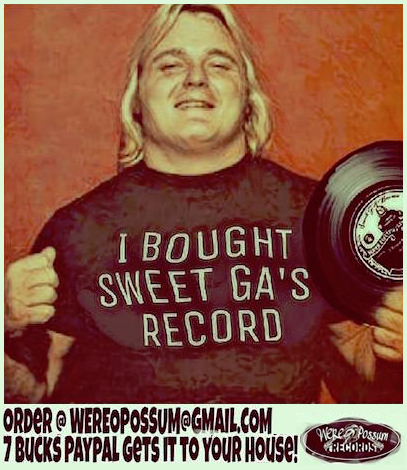 Greg Valentine: "I can't digest this." Ric Flair: "We've Done It All"
The undercard saw the team of S.D. Jones and Rufus R. Jones defeat Frankie Laine and Mr. X. Rufus was the dominant performer in this match. The ageless Johnny Weaver had no trouble putting away Doug Sommers. Don Kernodle and Rick McGraw took care of David Patterson and Frank Monte. During this time frame, Monte was faring much better in the world of bodybuilding than the world of wrestling. Brute Bernard got a rare win during this time of his fading career, besting Bob Marcus. Coco Samoa opened this memorable Richmond card with a win over Tony Russo. This was a truly great event to usher out the 1970’s and bring in the new decade with a bang! This feature is being re-published from an earlier feature on the Mid-Atlantic Gateway. 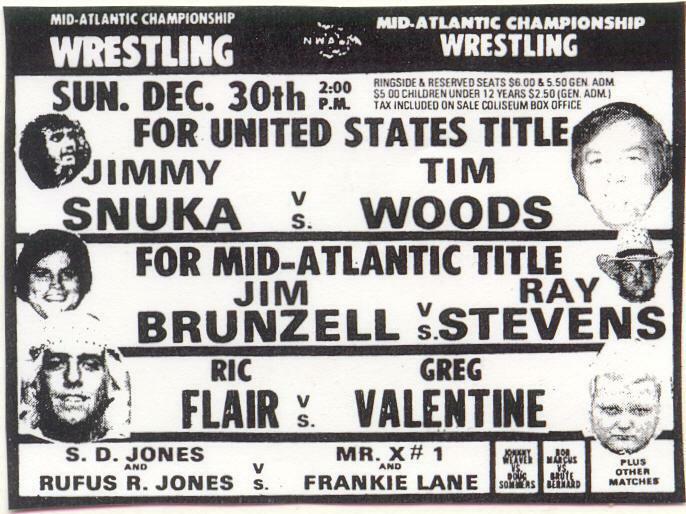 Nestled in the scenic Shenandoah Valley, the Augusta Expo in Fishersville, Virginia was a popular Thursday night “spot show” stop for the stars of Jim Crockett Promotions during the era of Mid-Atlantic Championship Wrestling. About a hundred miles northwest of Richmond and about a hundred miles north of Roanoke, “Expoland” served the wrestling needs of fans that were a little too far away from those bigger towns. 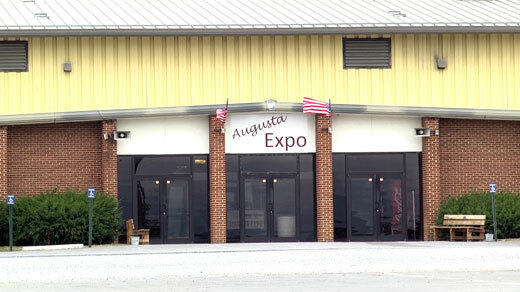 The Augusta Agricultural and Industrial Exposition in Fishersville (almost always called “Fisherville” on the local in-your-area promos) opened in 1969, and in the Mid-Atlantic days had a seating capacity of around 3,000. From 1977 through 1984, the Expo was home to Mid-Atlantic cards every few months, and every major wrestler from the territory appeared in this venue at one time or another. One of the earliest Mid-Atlantic cards that got Expoland in the regular spot show rotation was held on January 13, 1977 on a frigid night with temperatures close to zero degrees, where the main event pitted Mr. Wrestling and Dino Bravo against Blackjack Mulligan and Brute Bernard. Like most of the smaller spot show venues that were part of the Mid-Atlantic Championship Wrestling circuit, the Expo in Fishersville had a few interesting quirks. One of the biggest was that due to the configuration of the building and parking lot, the wrestlers parked in the main parking lot and entered the building through the same entrance as the paying customers. That led to some interesting scenarios when the wrestlers arrived at the building late for any reason! Soon after Paul Cormier saw Angelo Mosca, Jr. defeat Nikita Koloff by disqualification in a Mid-Atlantic Heavyweight Title match on that August 8, 1984 card, Augusta Expo ceased being a regular spot show venue for Jim Crockett Promotions. 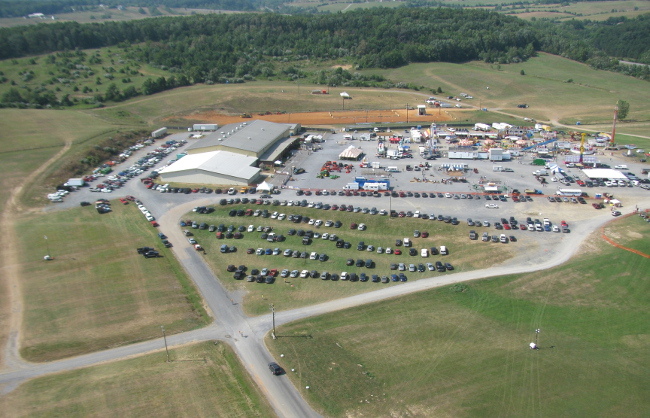 Big time wrestling did resume at the Expo in later years, principally when the Smokey Mountain Wrestling organization ran sporadic cards there in the early 1990s as one of its easternmost venues. After another gap in time, Expoland again hosted professional wrestling in 2009 and has seen some high caliber independent shows in recent years. Expo in Fishersville has had tenants ranging from musical acts, to craft shows to even rodeos over the years. 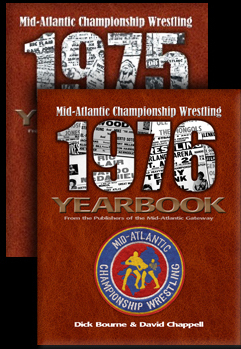 But arguably no act that has been booked at the Expo has ever generated the level of excitement that Mid-Atlantic Championship Wrestling did. While the closest big towns of Richmond and Roanoke got deeper cards of Mid-Atlantic wrestling, the top bouts at the Expo were generally strong. For Mid-Atlantic fans stuck between Richmond and Roanoke, wrestling on Thursday nights every so often at Expo in Fishersville was their wrestling oasis, and it certainly hit the spot! 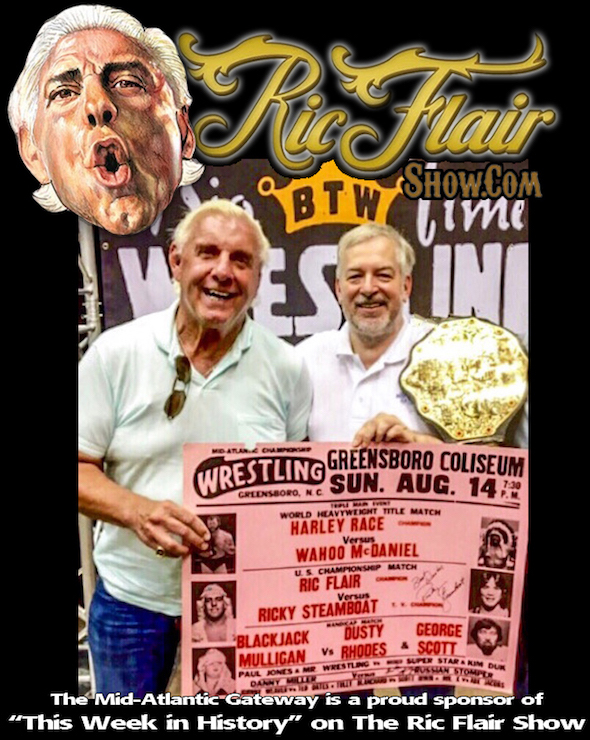 Flair and Steamboat Reunite for "Big Time Wrestling"
The big draw, especially for old-school fans, is the reuniting at all three shows of Ric Flair and Ricky Steamboat, arguably the two biggest names in wrestling to have ever come out of the old Jim Crockett Promotions territory. The two had one of the most legendary, longest running feuds in wrestling history. 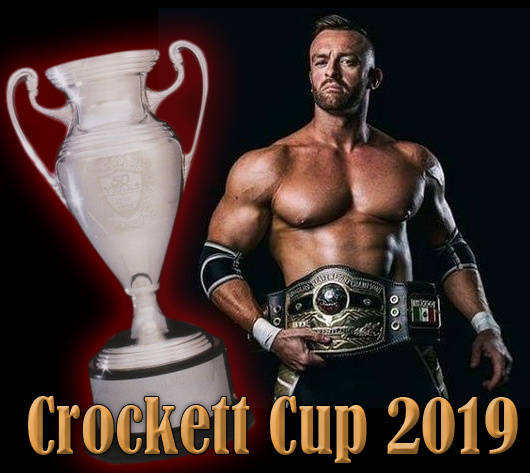 Flair and Steamboat will be joined by other names from the glory days of Crockett Promotions such as Magnum TA, Ivan Koloff, Jimmy Valiant, The Rock and Roll Express (Ricky Morton and Robert Gibson) and others, although not all of those names will be at each show. However, Flair and Steamboat will be at all three and there will be a rare opportunity to have your photo made with both of them together with a replica of the "Big Gold" belt that represented the NWA world heavyweight championship in 1989, the year that Flair and Steamboat traded that prestigious championship between each other. For more information on these shows and other shows going on around the country for the group, and to purchase advance tickets, visit Big Time Wrestling's website at btwtickets.com. Crockett Foundation: "When Wrestling Was Wrestling"
The Crockett Foundation has published their first book, "When Wrestling Was Wrestling", a collection of photographs taken by Jackie Crockett in the Mid-Atlantic area in the late 1970s and early 1980s. Jack and Jerry Brisco, "Nature Boy" Ric Flair, Sgt. Slaughter and Don Kernodle, Ricky Steamboat, Jimmy Valiant, Roddy Piper, Greg Valentine, Bob Orton, Jr., Jay Youngblood, Johnny Weaver, Paul Jones, Blackjack Mulligan, Baron Von Raschke, and many others. The book is available exclusively from the Crockett Foundation on their website. 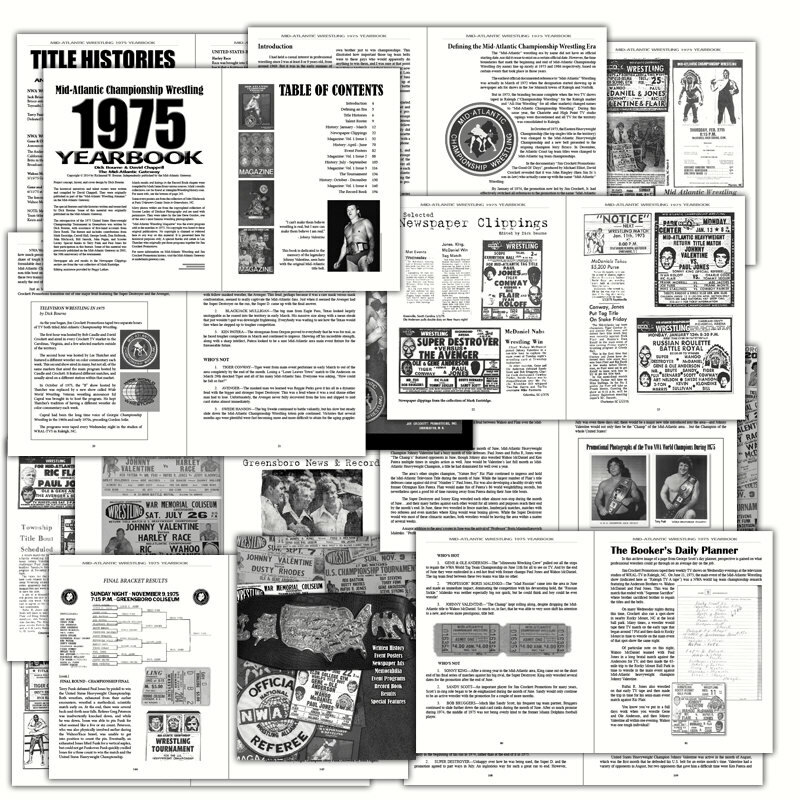 Take a walk down memory lane, in "When Wrestling Was Wrestling", complete with never before seen images from the Golden Age of Wrestling in the Crockett Foundation's first paperback book release. 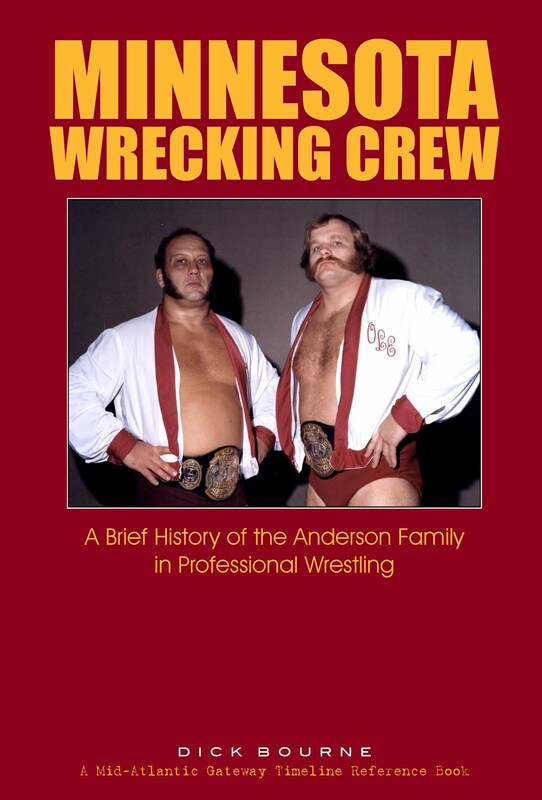 Inside the pages of this wonderful book you will find never before seen pictures taken by Jackie Crockett during his tenure as camera man for Jim Crockett Promotions. As the youngest son of Jim Crockett, Sr., he had unlimited access to some of the greatest names in professional wrestling history. You will definitely be taking a trip down memory lane as you page through the images contained in this gem. The book can be purchased through the Crockett Foundation online store. A portion of each sale goes towards helping veterans and retired service dogs in need. The Crockett Foundation is a tax exempt 501(C)(3) nonprofit organization. Ric Flair vs. Billy Starr from "World Wide Wrestling" in 1980. Commentary by Rich Landrum and Johnny Weaver. Mid-Atlantic TV tapings were on Wednesday nights at WRAL in Raleigh, so we thought it would be appropriate to share a little WRAL wrestling on this Wednesday. This match was shown as a special feature on "NWA Championship Wrestling" from Knoxville, TN hosted by Les Thatcher. Another nice set of photos mentioning a couple of my books along with replicas of the belts. I appreciate the support, JZ!